LOVE LETTERS is a unique play, or rather a sort of play, which needs no movement, no special set or costumes, not even a theater. The play follows the lives and relationship of its two characters through their written correspondences. It is designed to be performed by the characters simply reading the letters they wrote to each other, in chronological order, beginning in childhood. LOVE LETTERS was first performed on November 3, 1988 at the Long Wharf Theater in New Haven, Connecticut. It was directed by John Tillinger and starred Joanna Gleason and John Rubinstein. The play subsequently opened off-Broadway on February 13, 1989 at the PromenadeTheatre in New York City, starring Rubinstein and Kathleen Turner, before eventually opening on Broadway on October 31, 1989, with Jason Robards and Colleen Dewhurst. Born and raised in Kentucky with two older brothers and a younger sister, Kassie worked at Nashville's Opryland as a singer and, at the age of 18, debuted as a soloist at the legendary Grand Ole Opry. She later attended Indiana University and the University of California to study theatre. While attending UCLA, she became a member of a four-part harmony band called "Newport." After traveling with the USO on its Orient tour, Kassie sang back-up for soul singer Bobby Womack. Her first professional acting role was as "Bobby Jo" in the feature film Evil Dead II. From 1986 to 1991, she played good girl "Chelsea Reardon" on Guiding Light and also guest-starred on episodes of Melrose Place, Baywatch and Timetrax. Taking on the role of the beautiful, scheming "Blair Cramer" on One Life To Live marked Kassie's return to daytime television. Last year marked another milestone in Kassie's career, with the release of her first CD, Naked, now available on Nudgie Records & Tapes. 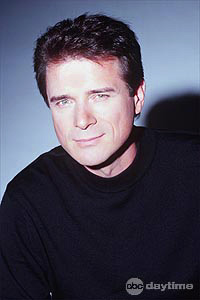 James plays "Max Holden" on One Life To Live, a Texas cowboy whose professional ambitions sometimes clash with his personal relationships. When he was 15 years old, James, the son of a musician, began his own professional career playing the electric bass. A native of Livermore, California, he played in a number of bands, but soon became more fascinated by the theatre. He studied drama and a number of important techniques at a nearby community college, while honing his craft in community theatre productions. After performing with a repertory theatre in Solvang, California, James acquired an agent and went to Los Angeles. Soon he appeared on ABC's General Hospital in the recurring role of the waiter who tried to romance "Holly Scorpio" (Emma Samms). James has a daughter, Dreama and, with wife Kassie, a son, JQ.